When it comes to taking care of your lawn, how confident are you? Are you able to get rid of weeds, fertilize it, and keep pests away? Lots of Americans have no idea, or have inaccurate ideas, about how to properly care for a lawn. Because of this, they hire a professional company to come to their house and take care of their lawn for them. Are you considering hiring a professional lawn service? Do you want to make sure you’re hiring the right one to care for your yard? If so, read on to learn more about how you can find the best lawn service Rockwall, TX can provide. Forty percent of Americans hire a professional to care for their lawn. Why are so many people choosing this option? When you hire a service to maintain your lawn, you also get to take advantage of their expertise. You’ll get a professional’s opinion on how to handle various issues, and you’ll likely end up with a better result than if you tried to address the lawn yourself. As you can see, there are lots of reasons to consider hiring a lawn care service. But, how do you make sure you’re hiring the right one? One of the first things you ought to do when you’re considering hiring a particular lawn care service, do some research to find out about their reputation. Are people generally happy with their services? Are there any complaints against them on third-party review sites, online business directories, or with the Better Business Bureau? Consider asking for references to see what people have to say about a particular service before you hire them. Any lawn care service that you hire ought to be licensed and insured. There are a few key benefits that come with hiring a licensed and insured company. First, you can see that they prioritize professionalism. You also can rest easy knowing that you will not be held liable if they are injured while working on your property. Their insurance will also cover any damage that occurs while they’re working on your lawn — the weed wacker hitting a rock and sending it through the window, for example. This is not an essential requirement, but you might want to consider looking to see if the lawn care professionals you’re considering hiring is a member of any trade organizations. This is a sign that they’re committed to learning new techniques and being apprised of the latest lawn care standards. Before you hire a particular company, check their website to see if they have pictures of their past work available for you to look at. Do you like the type of work they do? Do you want them to try and replicate a specific project in your yard? It’s always a good idea to get a quote before you decide whether or not you want to work with a lawn care service. Most services offer a free quote or at least have a general pricing list on their website to help you figure out how much they’ll charge for various services. Be sure to get quotes from a couple of different services before you make a decision. Remember, though, that the cheapest service isn’t necessarily the best one to go with. You get what you pay for, after all. Of course, you need to make sure that the lawn care service you’re considering offers the specific services you need. Make sure, at the very least, that they handle basic things like fertilization, weed control, and pest control. You should be able to check their website to see what kind of services they offer. If they don’t have a services list posted, don’t be afraid to call them up and ask. Don’t forget to ask about the type of products the company uses to fertilize and care for your lawn. Will you need to stay off the lawn after it’s applied or keep your pets off of it for a certain period of time? Find out their procedure for getting rid of different types of weeds, too. Make sure they have different strategies in place to deal with different lawn care issues. When you call or email to ask questions or set up an appointment, how are you treated? Is their receptionist polite and professional? Do they respond to emails promptly? If you’re going to be working with this company long-term, you need to make sure they offer great customer service. Finally, find out if a particular yard car service requires you to sign a contract when you work with them. This isn’t necessarily a good or a bad thing, but it’s a good idea to know what you’re getting into before you agree to work with a particular company. That way, there won’t be any surprises later on. Now that you know how to find the right lawn care service, it’s time to begin your search! If you live in or around the Rockwall or Parker areas, contact us at Abracadabra Lawn, Pest, and Weed Control. We offer a wide range of lawn care services, including weed control, fertilization, pest control, and more. When you work with us, you’ll get the best lawn service Rockwall, Texas can provide. You think you’re doing everything right with your lawn. You water it within guidelines, you fertilize every year, and you even aerate. Then, one day, it appears: a weed. That tiny menace will take over your entire yard if you don’t nip it in the bud. The first step to keeping your lawn weed-free is being able to recognize a weed when you see it. While there are plenty of varieties of weeds, here’s a crash course in the Texas weeds you’re most likely to see. What Are the Most Common Texas Weeds? The United States has a huge range of climates, and the weeds that grow in Texas are different from those that grow in Wisconsin. Here are the most common enemies you might spot in your lawn. Remember when you were a child and thought dandelions were beautiful yellow flowers? You probably didn’t understand why your parents kept trying to get rid of them…until you saw a house whose entire yard was made of dandelions. Yikes. The dandelion’s bright yellow flower makes it an easy weed to identify. It also spreads faster than many other weeds because the wind blows its seeds around when the flower turns into a cotton-like seed ball. Dandelions love spring, so watch for them in March, April, and May. Unlike dandelions, rescuegrass is a grassy weed. This means that it looks like grass but invades lawns like a weed. Rescuegrass features flat, spiky grass blades. You might only notice it because it looks slightly different in the middle of your planted grass. Rescuegrass tends to appear in the winter and early spring. Some homeowners think winter brings a reprieve from lawn work and weed treatments. Sorry folks, but chickweed won’t let that happen. Chickweed is a weed that looks similar to a clover. It’s a short plant with many tiny circular leaves, and it tends to grow in the winter. Some resourceful folks have found uses for chickweed to make the best out of an unwanted situation. The good news is that chickweed dies by the time summer begins. Still, if you don’t want to look at its ugly mug all winter and spring, you can treat it instead. You may have heard poa annua go by the name “bluegrass,” but it’s not the Kentucky bluegrass some homeowners seek out. This type of bluegrass is a weed and a challenging one to get rid of at that. Poa annua looks like an uneven grass with the typical bluegrass shape. Later in its lifespan, it exposes clusters of light yellow and white seeds. Some homeowners don’t realize that they have a weed on their hands until those seeds appear. The problem is that if you have St. Augustine grass, the only way to control poa annua is to treat it before it sprouts. Crabgrass is a weed that needs no introduction. It’s one of the most widespread weeds and one of the most stubborn ones too. Crabgrass has wide, flat blades. It looks like someone rubbed your grass around like a big brother tousles his little brother’s hair. It’s not pretty and the seeds tend to stick around for a long time. Keep in mind that if you have a history of crabgrass, you should take precautions before aerating your lawn. The aeration can give hidden seeds the light and air they need to take root. We’ve all been there. 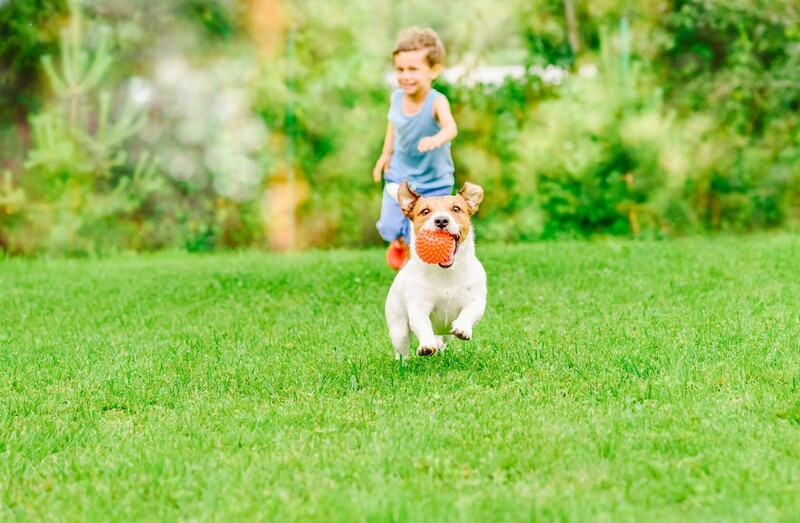 Your family is enjoying a game of tag or catch in the yard, enjoying your lush grass. Then, mid-frolic, you step on what feels like a pile of needles. You look down to see a thistle plant and you could swear it’s smirking at you. Thistles have distinctive ruffled leaves that look like pointy kale. The leaves are covered in tiny spikes. The most important factor to note when you spot a thistle is whether it has flowers. Treating it before it flowers will make it far easier to treat. Like dandelion, henbit initially looks pretty enough that you wouldn’t consider it a problem. Its delicate scalloped leaves and tiny purple flowers look perky and enjoyable…until it spreads and turns into a pest. Henbit tends to surface in early spring, so keep an eye out in the coming months. It’s also more likely to appear in your decorative landscaping and under trees rather than among your grass. At first glance, dallisgrass looks similar to crabgrass based on the size and shape of the blades. The key difference is that dallisgrass grows in a circular pattern. Over time, those circles grow larger and larger. As with many weeds, dallisgrass has a way of choking out the planted grass you love. This particular weed grows fast, though, at around twice the rate of typical grass. It can put a hurt on your lawn in a hurry if you don’t treat it right away. The best way to describe purslane is to say it looks like an enlarged clover. The red stems and the paddle-shaped leaves are distinctive enough to spot with ease. While most weeds are annuals, purslane is a perennial. That means the seeds stick around and the plant comes back year after year. It’s a stubborn challenge for any homeowner and when you’re losing the battle, it sticks out like a sore thumb. Keep in mind that purslane shows up in the late spring and early summer. The sooner you find it the easier it is to treat, so start watching for it in April and May. Your lawn is a vital part of your home’s appearance. It can add to your curb appeal or take away from it, and sometimes the smallest factors make all the difference. Weeds are among those small factors. Whether you’re trying to sell your home or you just want it to look nice, knowing and tackling the Texas weeds above will be a strong start. A word of wisdom, though: don’t try the DIY route. That’s how you end up with a lawn full of dead grass. For an expert touch, contact our weed control and lawn care team.